Dimensions:Table:22.74 in. deep, 36.98 in. tall, 40.21 in. wide. Chairs(per unit):14.58 in. deep, 24.17 in. tall, 12.58 in. wide. 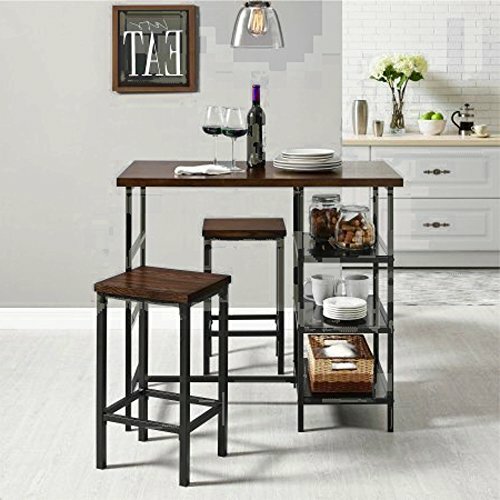 Pub Style Table Set is a High Quality Elegant Durable Metal Frame Table and Chairs Dining Set for your Livingroom or Kitchen Bar that will accompany you in your Dinner time at your Home Bar. Thanks to the Premium Quality Elegant Materials and the Contemporary Design Of this Bar Dining Set the Room of your Choice will be a Relaxing Environment. The all time Classic Casual Look will be Ideal for not Only Special Occassions but also thanks to the Durable Materials for Everyday Use too. Enjoy the best Quality and Classic Style along with durability and Practicality with the Ultimate Bar Dining Set.The Classic Bar Dining Set.